It's quite a switch from the projects co-directors Leah Warshawski and Christopher Tower usually make for Microsoft. But on May 29th, at the Seattle International Film Festival, the pair will complete a thrilling documentary journey. 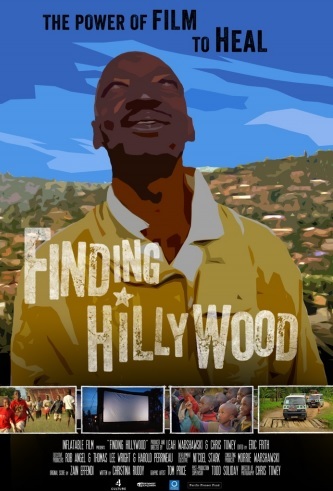 Finding Hillywood, which began shooting in 2008, is all about an ongoing traveling film festival in Rwanda. By means of an inflatable screen, citizens in rural areas are given free access to inspiring, diverting cinema. What makes the upcoming world premiere screening so special is that Warshawski and Tower were able to raise funds for the oldest member of the dedicated Hillywood festival crew to travel to Seattle to join them. Ayuub Kasasa Mago, a father of four, first got drawn into filmmaking as a location scout for The Last King of Scotland. His personal struggles with the legacy of his country's genocide, which claimed his own mother, frame the documentary. If you were to say that Ayuub is one of the pillars of Rwandan cinema, you would not be far from the truth. He’s one of the few who has done everything in cinema and done it well. He’s been director, location manager and even an actor. He’s been doing it for ten good years. The Seattle scenario gets better. Thanks to the upcoming fundraised trip from Africa to the Pacific Northwest, Mago will also get to present Fora, a seven-minute short he directed and stars in. It tells the tale of a father who learns a valuable lesson from his sons and will play in tandem with Finding Hillywood. One of the people lucky enough to have already seen Finding Hillywood is Phil Alden Robinson, the writer-director of Field of Dreams. He raves: "Finding Hillywood gives me goose bumps. In an era of mega-budgets and special effects, here’s a fascinating, compelling and universal story about the power of… story. It reminds me of why some of us became filmmakers, and why all of us became film lovers." I love the poster. Who did that artwork for you?